Second Act and we’re back to three songs. Entr’acte – There isn’t much to say on this on a contextual level as it just a the choir singing a melody of the songs as while as music in latin. That being said, it’s gorgeous. I really love Out There in latin. It’s the prefect capsule of the Disney score of the Hunchback of Notre Dame. Flight into Egypt – Another New Song for the production. This song differs between the La Jolla version and the cast album i.e. the Papermills version as the remove a verse from the La Jolla cast and replace it with a verse about the Amulet map. In the La Jolla version Esmeralda gives him the map after the song. In a way this song replaces A Guy Like you, in that Quasimodo’s friends offer him encouragement by way of a song. There is also the little matter of both song give Quasimodo the idea that Esmeralda Like-likes him. As much as I don’t want to defend A Guy Like you, I’m going to. In a A Guy Like you the Gargoyles plant that idea into Quasimodo’s head, whether they are Quasimodo imaginary friends or not is a mute point. In this song Quasimodo likens protecting Esmeralda to being like a bride. 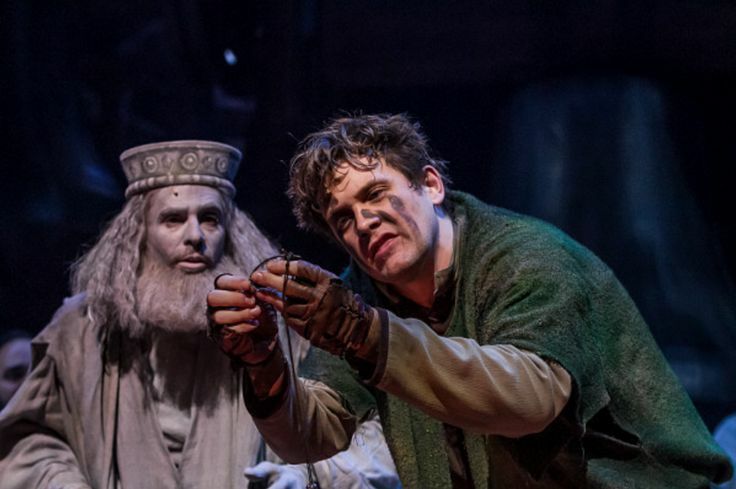 I think the propping up of Quasimodo’s hope by his pals and then the having his hope dashed is more heart-breaking than a mild thought across his mind especially where Quasimodo has inability to believe anyone could love him, it hard to take in that he would reach that conclusion. Unless it really was just a passing fantasy but that makes the heartbreak and the pain less believable. I mean the song is just encouraging Quasimodo to save her like a beheaded Saint. That being said Flight into Egypt is better than A Guy Like you. A Guy Like you is really mean-spited. One thing that weird is that Quasimodo doesn’t know the name of Saint Aphrodisius. I mean it’s played for a laugh but for a guy whose life was Notre Dame and studied the religion it’s just weird. Though maybe Quasimodo was friends with the Stained Glass windows. I will say that way they did Saint Aphrodisius in the La Jolla show with the singer’s head going off and on was the best bit of stage craft so far. As the Song goes, it’s pretty good. It’s a nice melody and ties into Notre Dame well. The Court of Miracles – The tempo on this song has been slowed down. This makes it creepier but far less fun than the Disney version. They also have replaced a lot of lyrics from the movie. For instance the line from the movie “We find you totally innocent, which is the worst crime of all.” with “We have to protect at all costs our secret; it’s our lives or yours, so you’re going to hang.” From mu understanding this could be because any reference to Frollo being a judge has been taken out and in that line Clopin was mocking Frollo, so they replaced it. I also miss the line where Clopin asked if Phoebus and Quasimodo have any last words and they being gag muff something and Clopin says “That’s what they all say.” Now it’s “Didn’t think so.” Again they removed Clopin mocking judges and such. Beat for beat the song is the same I just didn’t care for this rendition.